Cycled to Venice Beach today (have a magic route, as vouchsafed by our biking neighbours; may post it someday should we try it again). Couldn’t decide what to have for lunch, so we had sushi! (This makes it something like 4 days in a row that we’ve had sushi: Thurs monkfish liver sushi with the boss, Fri inari sushi and spicy tuna roll for lunch; Sat chirashisushi in Westwood after a few yucky hours at work. You can tell we’re liking this availability of sushi, can’t you? Either that or we’re just unimaginative.) 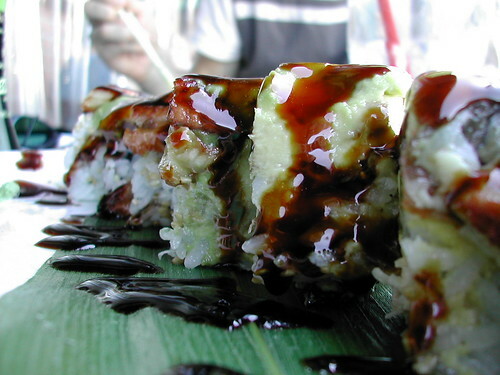 Today’s sushi came from Naked Sushi on Washington Blvd, which hooks up with Venice Beach pier. We initially ordered the spider roll, but they’d run out of ingredients (the crab, I guess) so we greedily asked for the dragon roll instead. 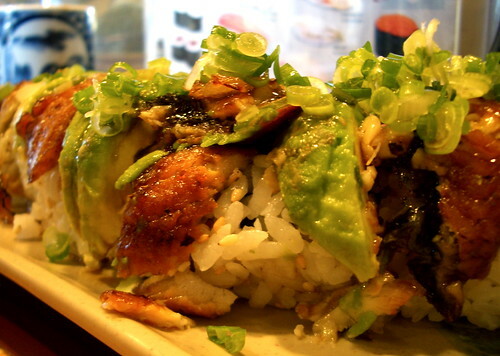 There’s nothing quite like unagi. And adding avocado to the mix just makes the kiddies in us so happy.